part of my daughter's wedding. 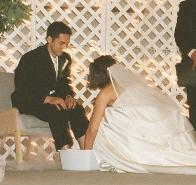 TO CHEW ON: "If I then your Lord and Teacher have washed your feet, you also ought to wash one another's feet." - John 13:14. There are layers of meaning captured in this beautiful story of Jesus washing the disciples' feet—told only by John. Jesus meant for this act to puzzle the disciples—to provoke them to being alert to its meaning. He said, "What I am doing you do not understand now, but you will know after this" John 13:7. "Then I will sprinkle clean water on you and you shall be clean; I will cleanse you from all your filthiness and from all your idols" - Ezekiel 36:25. But Jesus' insistence that their feet did need washing (John 13:10) suggests that even after we are cleansed by Jesus' atoning blood we continue to need cleansing from the defilement we pick up as we walk through life. "Jesus was probably not seeking to institute a literal practice to be observed continually in the church, although some feel this to be the case. But He shows great concern that the meaning of true servanthood be well understood that no one deem it beneath his dignity to perform the most menial of tasks for others. Ultimately servanthood is a disposition of the heart and spirit, which expresses itself in concrete actions" - Siegfried Shatzmann, New Spirit-Filled Life Bible, p. 1467 (emphasis added). PRAYER: Dear God, help me to understand Your example of washing feet and how that translates into action in my life. Thank You for Your cleansing blood. Help me to wash my feet every day as I repent of the sins that dirty me along the way. Amen. Today the church celebrates the Feast of St. John, the writer of today's Scripture reading. He served us well with his contribution to the Bible—the Gospel of John and the three epistles, 1, 2 & 3 John. "Shed upon your Church, O Lord, the brightness of your light, that we, being illumined by the teaching of your apostle and evangelist John, may so walk in the light of your truth, that at length we may attain to the fullness of eternal life; through Jesus Christ our Lord, who lives and reigns with you and the Holy Spirit, one God, for ever and ever. Amen."